For other uses, see American University (disambiguation). The American University (AU or American) is a private research university in Washington, D.C. Its main campus spans 90 acres (36 ha) near Ward Circle, a residential area in the northwest of the District. AU was chartered by the U.S. Congress in 1893 at the urging of Methodist bishop John Fletcher Hurst, who sought to create an institution that would promote public service, internationalism, and pragmatic idealism. AU broke ground in 1902, opened in 1914, and admitted its first undergraduates in 1925. Although affiliated with the United Methodist Church, religious affiliation is not a criterion for admission. American University has eight schools and colleges: the School of International Service, College of Arts and Sciences, School of Business, School of Communication, School of Professional and Extended Studies, School of Public Affairs, School of Education, and the Washington College of Law (WCL). It has over 160 programs, including 71 bachelor's degrees, 87 master's degrees, and 10 doctoral degrees, plus J.D., LL.M., and S.J.D programs; individualized interdisciplinary programs are also available at the bachelor's level. AU's student body numbers over 13,000 and represents all 50 U.S. states and 141 countries; around a fifth of students are international. The American University was established in the District of Columbia by an Act of Congress on December 5, 1892, primarily due to the efforts of Methodist bishop John Fletcher Hurst, who aimed to create an institution that could train future public servants. Hurst also chose the site of the university, which at the time was the rural periphery of the District. After more than three decades devoted principally to securing financial support, the university was officially dedicated on May 15, 1914, with its first instructions beginning October of that year, when 28 students were enrolled, 19 of whom were graduates and the remainder special students not candidates for a degree. The First Commencement, at which no degrees were awarded, was held on June 2, 1915. The Second Annual Commencement was held the following year and saw the awarding of the first degrees: one master's degree and two doctor's degrees. AU was notable in admitting women and African Americans, which was uncommon in higher education at the time; among its first 28 students were five women, while an African American doctoral student was admitted in 1915. Shortly after these early commencement ceremonies, classes were interrupted by war. During World War I, the university allowed the U.S. military to use some of its grounds for testing. In 1917, the U.S. military divided American University into two segments, Camp American University and Camp Leach. Camp American University became the birthplace of the United States' chemical weapons program and the site of chemical weapons testing; this required a major cleanup effort in the 1990s. Camp Leach was home to advanced research, development, and testing of modern camouflage techniques. As of 2014[update], the Army Corps of Engineers is still removing ordnance including mustard gas and mortar shells. Instruction was initially offered only at the graduate level, in accordance with the original plan of the founders. This changed in 1925 with the establishment of the College of Liberal Arts (subsequently named the College of Arts and Sciences), which offered the first undergraduate degrees and programs. What is now the School of Public Affairs was founded in 1934, partly to educate future federal employees in new approaches to public administration introduced by the New Deal; during the event commemorating its launch, President Franklin D. Roosevelt stressed cooperation between the school and his administration. AU's relationship to the U.S. government continued during World War II, when the campus hosted the U.S. Navy Bomb Disposal School and a WAVE barracks. For AU's role in these wartime efforts, the Victory ship SS American Victory was named in its honor. The post-war period saw considerable growth and restructuring of AU. In 1947, the Washington Semester Program was established, pioneering the concept of semester-long internships in the nation's capital. In 1949, the university merged with the Washington College of Law, which had begun in 1896 as the first law school founded by women and the first coeducational institution for the professional study of law in the District. Shortly thereafter, three departments were reorganized as schools: the School of Business Administration in 1955 (subsequently named the Robert P. and Arlene R. Kogod College of Business Administration and in 1999 renamed the Kogod School of Business); the School of Government and Public Administration in 1957; and the School of International Service in 1958. In the early 1960s, the Department of Defense and the Central Intelligence Agency operated a think tank under the guise of Operation Camelot at American University. The government abandoned the think tank after the operation came to public attention. AU's political involvement was furthered by President John F. Kennedy's Spring 1963 commencement address. 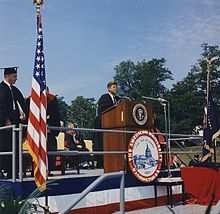 In the speech, Kennedy called on the Soviet Union to work with the United States to achieve a nuclear test ban treaty and to reduce the considerable international tensions and the specter of nuclear war during that juncture of the Cold War. In 1988, the College of Public and International Affairs was reorganized to create two free-standing schools: the School of International Service and the School of Public Affairs, incorporating the School of Government and Public Administration and the School of Justice. That same year, construction on the Adnan Khashoggi Sports Center completed while the Iran–Contra Affair controversy was at its height although his name remained on the building until after Khashoggi defaulted on his donation obligation in the mid to late 1990s. In fall 2005, the new Katzen Arts Center opened. Ground was broken for the new School of International Service building on November 14, 2007, and completed in 2010. A speech was given by Senator Daniel K. Inouye (D-HI). In 2015, American began to offer an accredited, accelerated online MBA program. Neil Kerwin retired as AU's president at the end of May 2017. The current president is Sylvia Mathews Burwell, whose tenure officially began on June 1, 2017. As of the 2017–2018 academic year, a female tuxedo feral cat took up residence on the campus grounds near the McKinley School of Communications building. School students and staff maintain the cat's small shelter and feeding station and dubbed her "Wonk Cat". Wonk Cat has been adopted by the campus community at large including in university social media postings and her own student-run social media sites. In 2017, Taylor Dumpson become AU's first black student body president. In her first full day in office, bananas were found at three places on campus, hanging from noose-like ropes, and marked with the initials "AKA", which are also the initials of the Alpha Kappa Alpha sorority. The university considered the incident to be racist, and then-president Neil Kerwin called it a "cowardly, despicable act." In May 2018, the school said it had exhausted "all credible leads" about who had perpetrated the incident. Also in May 2018, Dumpson filed a lawsuit against a number of people, including Andrew Anglin, the founder of the neo-Nazi website The Daily Stormer. She accused Anglin of organizing a racist and sexist trolling campaign against her. She alleged that Anglin posted her name, her picture, links to her Facebook page, and to the Twitter page of the university's student government, and urged his readers to "troll storm" her, which resulted in many hate-filled and racist online messages directed at her. Although Dumpson and Anglin have not reached a settlement, she settled in December 2018 with one of the people who harassed her, a man from Oregon who was required to apologize, to renounce white supremacy, to stop trolling and doxing online, and to provide information to and cooperate with authorities in the prosecution of white supremacists. American University has two contiguous campuses used for academics and student housing: the main campus on Massachusetts Avenue, and the East Campus on Nebraska Avenue. The Washington College of Law has since been moved to the site of the Tenley Campus located in Tenleytown. Additionally, AU owns several other buildings in the Tenleytown, Spring Valley, the East Campus in Wesley Heights, and American University Park areas. The first design for campus was done by Frederick Law Olmsted but was significantly modified over time due to financial constraints. The campus occupies 84 acres (340,000 m2) adjacent to Ward Circle, the intersection of Nebraska and Massachusetts Avenues. AU's campus is predominantly surrounded by the affluent residential neighborhoods characteristic of the Northwest quadrant of Washington, D. C. The campus includes a main quadrangle surrounded by academic buildings, nine residential halls, a 5,000-seat arena, and an outdoor amphitheatre. The campus has been designated a public garden and arboretum by the American Public Garden Association, with many foreign and exotic plants and trees dotting the landscape. Abbey Joel Butler Pavilion: holds the campus store, the Office of Campus Life, the Career Center, and meeting spaces. Battelle-Tompkins Building: The university library until 1977 and now home to the College of Arts and Sciences. Hurst Hall: First building of the university, ground broken in 1896 for what was to be the College of History. The architects were Van Brunt & Howe. Now home to departments of Biology and Environmental Science, the School of Public Affairs, the University Honors Program, and the Center for Teaching Excellence. Katzen Arts Center: Provided for by a monetary gift from Cyrus and Myrtle Katzen, the building opened in 2005 and is now home to the Departments of Performing Arts (such as dance), Studio Arts, Graphic Design, and Art History, the American University Museum, and other Academic Departments. Kay Spiritual Life Center: built in 1963 as a multi-denominational place of worship. Nicknamed the "flaming cupcake" due its round shape and 16-foot-tall impressionistic flame top, Kay is home to offices of the university chaplains and is used for speeches, performances, and community events. Kerwin Hall: The largest classroom building on campus, built in 1968 as a home for the School of Government and Public Administration (now the School of Public Affairs). Kogod School of Business: Formerly known as the Myers-Hutchins Building, and previous home to the Washington College of Law. Construction finished in January 2009 to annex it to the now empty Experimental Theater and Butler Instructional Center. Mary Graydon Center: Home to student organization offices, the main dining facilities, and the School of Communication. McKinley Building: Cornerstone laid by President Theodore Roosevelt. Was previously the home of the departments of Computer Science, Audio Technology, and Physics. Has recently become the new home to the School of Communication since newer renovations. School of International Service: Ground broken by President Dwight Eisenhower. The new building opened for the 2010–2011 school year, with classes continuing to be held also in the original building, which has since been renamed the "East Quad Building", next door. The School of International Service has an enrollment of over 2,000 undergraduate students and an enrollment of over 900 graduate students. American University (Bender) Library, which holds over a million books. The university recently added 1000 beds in 2013. Residence halls on the main campus are grouped into three "campuses". Nebraska Hall, located across Massachusetts Avenue from main campus. It features apartment-style residences. Cassell Hall, opened for the Fall 2013 semester. This residence hall is equipped with a state of the art 8,000 sq ft (740 m2) fitness facility. Centennial Hall, featuring suite-style living originally intended as housing for upperclassmen. Formerly the Immaculata School, Tenley Campus is located half a mile east of the main campus, and was purchased by American University in 1987 specifically for the Washington Semester program. Tenley Campus used to be home to the Washington Semester and Washington Mentorship Program students, which featured housing primarily for international and transfer students. Before construction of the new Washington College of Law, Tenley Campus was home to the main offices of: the School of Professional & Extended Studies, including the Washington Semester Program, University Marketing and Publications, and the Osher Lifelong Learning Institute. During the summer, the residence halls were used to house students in the Washington Semester - Summer Internship Program. Since 2016, Tenley Campus has been home to American University's law school, the Washington College of Law. Over the course of several years, former dormitory halls and academic buildings were torn down and replaced with a number of newer, more contemporary academic buildings that now house the Washington College of Law. Ironically, the law school's reputation has fallen sharply since construction began on the new campus. Graduates are reportedly saddled with enormous amounts of debt, and in 2014 only 42% of graduates held jobs that required they pass the Bar. Renovation of water pipes across campus. Construction of new Hall of Science building in formally vacant grassy field on South Side of campus. Admission to AU is rated as "more selective" by U.S. News & World Report. For the Class of 2021 (enrolling fall 2017), AU received 19,325 freshmen applications; 5,008 were admitted (25.9%) and 1,082 enrolled. The average high school grade point average (GPA) of the enrolled freshmen was 3.66, while the middle 50% range of SAT scores were 590–690 for critical reading, 560–650 for math, and 570–670 for writing. The middle 50% range of the ACT Composite score was 26–31. American University's undergraduate program was tied for 69th among "national universities" in U.S. News & World Report's 2017 rankings, but slipped such that by 2019 it had a U.S. News & World Report rank of tied for 78th. In 2008, 2010, 2012, and 2018, American University was named the most politically active school in the nation by The Princeton Review's annual survey of college students. In 2006, the Fiske Guide to Colleges ranked AU as a "Best Buy" college for the quality of academic offerings in relation to the cost of attendance. However, in 2013, the Daily Beast listed the school in their list of "20 Least Affordable Colleges". For two years in a row, American University has had more students chosen to receive Presidential Management Fellowships than any other college or university in the country. In spring 2006, 34 graduate and law students were chosen for the honor. American University routinely ranks among the top mid-sized universities for producing Peace Corps volunteers. Among The Association of Professional Schools of International Affairs (APSIA) schools, AU School of International Service has the largest number of minority students and female students and is ranked 6th among APSIA schools in numbers of international students. A review in Foreign Policy Magazine ranked the school 8th in the country for preparing future foreign policy professionals and 25th for academic careers. SIS's undergraduate programs earned a spot at number 11, and its graduate programs were ranked number 8. Because the field of international relations is not evaluated by U.S. News & World Report, the College of William and Mary recently published the results of their survey, which ranked the AU international relations master's degree in the top 10 in the United States and the doctoral degree in the top 25. The School of Communication is among the top 25 in the nation, and it graduates the third largest number of communication professionals among U.S. colleges and universities. The School of Public Affairs is ranked 19th in the U.S. by U.S. News & World Report for 2016. The cross-campus American University Center for Innovation (AUCI) was recognized the Association to Advance Collegiate Schools of Business (AACSB) as one of the world's top twenty entrepreneurship centers in April 2017. At the undergraduate level, AUCI offers an entrepreneurship minor for all university majors and a specialization for business school students. American University is also home to a unique program known as the Washington Semester Program. This program partners with institutions around the world to bring students to AU for a semester. The program operates as part of the School of Professional & Extended Studies. The program combines two seminar courses on three days a week with a two-day-per-week internship that gives students a unique look at Washington, D. C. The program is unique in that the courses are not typical lecture courses; instead, speakers from various sectors of a particular field are invited to address the class, often from different perspectives. On September 24, 2018 AU President Sylvia M. Burwell announced the formation of the Sine Institute of Policy and Politics. Taking advantage of AU's location in the nation's capital, the institute will bring together scholars, journalists, and experts from the public, private, and nonprofit sectors in an effort to find common ground and bipartisan policy solutions to the nations problems. The Sine Institute launched with a conversation between Burwell and Republican Senator Bob Corker of Tennessee. AU has over 240 recognized organizations on campus, ranging from political and social. The Student Union Board (SUB), a part of the Student Government, is AU's oldest student-run organization. Since 1963, the SUB has arranged big name concerts and live entertainment for AU. Acts have ranged from the Grateful Dead to Ben Folds. Past acts include Bob Dylan, Nirvana, Red Hot Chili Peppers, Andrew W.K., Phantom Planet, Everclear, Ben Kweller, Jimmy Eat World, Paramore, Stephen Lynch, Jim Gaffigan, Snow Patrol, Ghostface Killah, Ted Leo and the Pharmacists, Blackalicious, Metro Boomin, and Hayley Kiyoko. SUB also screens free second-run movies for the AU community, known as SUB Cinema. American University also has an internationally top-ranked Model United Nations team, which competes actively at intercollegiate tournaments, and also hosts yearly High School Model UN competitions on campus. While American University is affiliated with the United Methodist Church, it also has many organizations that serve students of other religions. In addition to the AU United Methodist Community, American University has a variety of religious life groups, including Chabad Lubavitch of the AU Community, American University Hillel, the Jewish Student Association, and many others. American University has a Panhellenic Association (PHA), Interfraternity Council (IFC), National Pan-Hellenic Council (NPHC), and Multicultural Greek Council (MGC). There are also several independent organizations. In 2014, American University ranked #2 in the Sierra Club's list of the 'Top 10 Greenest Colleges'. In 2014, the university announced an ambitious project to build a solar farm in partnership with George Washington University. As of January 2016[update], the completed solar farm provides an equivalent of 50% of the university's energy. In 2018, American University became the first university in the United States to achieve carbon neutral status. A member of the Patriot League, AU has several sports teams including men's and women's basketball, soccer, cross-country, swimming & diving, track, women's volleyball, field hockey, and lacrosse, and men's wrestling. Club sports, such as rugby, rowing, ice hockey, field hockey, equestrian and ultimate frisbee also have teams. AU's football team had their last season in 1941. Bender Arena, a multi-purpose facility, hosts many of American's athletic competitions. Bender Arena opened its doors on January 23, 1988, when AU's women's basketball team hosted James Madison University. Reeves Field, home to AU's soccer team, earned the 2002 College Soccer Field of the Year by the Sports Turf Managers Association, hosted its fifth NCAA Tournament game, and served as the training site for the Uruguayan national football team. Reeves Field features a six-lane track to accommodate the track and field programs at AU and functions as a multi-purpose event site. American University has seven tennis courts and two basketball courts complete in the outdoor recreational facility located next to Reeves Field and behind Bender Arena. AU has hosted Patriot League tennis team championships three times since joining the league. Both the men's and women's tennis teams have been cut from the athletics program. American University Television (ATV) is a student-run organization based at American University. The station's programming runs through the residence halls and throughout campus on channels 2 and 15, as well as streaming content online. ATV was founded in 1979 as WAVE-TV to serve as a new media outlet for AU students beyond the existing student newspaper and radio station. In 1981, WAVE-TV was formally recognized by the AU Student Confederation, and began full operation as a campus wide closed circuit television station, which broadcast three nights a week. WAVE-TV was funded by the Student Confederation and by local advertisers. In 1989, WAVE-TV was renamed to American Television (A-TV2, later shortened to ATV). Over the course of the 1990s, ATV became available to televisions in student residence hall rooms, and significantly expanded its programming. In 1996, ATV was recognized by the Society of Professional Journalists, receiving the Mark of Excellence award in sports reporting and overall newscast. Until the early 2000s, ATV filmed most of its shows in the SOC Media Production Center. Following AU's renovation of the Mary Graydon Center in 2002, ATV moved into a new dedicated studio and office space on MGC's second floor, outfitted with cameras and equipment donated to the station by AU alumni Norman and Mary Klotz ('76, '79). Shortly after the move, ATV began broadcasting its programs 24 hours a day, 7 days a week for the first time. ATV launched its first dedicated website in 2007, and launched an online live-stream simulcast of its on-campus broadcast in 2009, expanding the reach of the station's programming beyond an on-campus student audience for the first time. Most of ATV's viewers are now online. In 2011, ATV launched an innovative new rebranding campaign, along with a new logo and station imaging, bringing greater campus visibility to ATV's programming and participation opportunities. ATV News provides the latest news both around campus and around the Washington, D. C., area. The weekly news program provides student-run coverage about politics, sports, entertainment, and weather. ATV Special Broadcast gives exclusive interviews with guests from the Kennedy Political Union and the Student Union Board. ATV Shortz features episodic student-created short sketches. Rapid Fire is a compilation of student-created comedic skits, with each skit being roughly 10 to 30 seconds long. The American Dream has a combination of late night comedy and talk show, as well as a sitcom with the host, Jason Gaines and the show's varied correspondents as they work behind-the-scenes to run the show. SportsZone has a group of panelists discuss the latest sports news where they make predictions and cover campus athletics. Superheroes Registered is an episodic crime drama about conflicts between superheroes and villains vying for control of the city. It shows the real-life implications of a world of superheroes and villains. Similar to the style of Marvel's recent films, the show can be a serious drama, but has playful aspects as well. ATV in the TAV is a variety show in the vein of Saturday Night Live that features the best content of ATV. It is broadcast in the Tavern at 7:00 p.m. every other Tuesday. Since 1947, American University has also operated a Washington Semester Program, which allows students to learn about public policy and experience the nation's capital from its campus. Program alumni include US House Speaker Paul Ryan, 1988 Democratic presidential nominee Michael Dukakis, former US Secretary of Health and Human Services Donna Shalala, former US Senator Max Cleland, former US congressmen Jim Nussle and Paul McHale, and 2012 Obama for America deputy campaign director Stephanie Cutter. ^ a b c "Common Data Set 2016-2017" (PDF). Retrieved February 15, 2018. ^ "American University Creative Style Guide". Retrieved April 18, 2017. ^ "American University Act of Incorporation". US Congress. December 5, 1892. Retrieved April 15, 2017. ^ Gross, Daniel A. (Spring 2015). "Chemical Warfare: From the European Battlefield to the American Laboratory". Distillations. 1 (1): 16–23. Retrieved March 20, 2018. ^ "The School of Public Affairs at American University". Spa.american.edu. Retrieved July 23, 2012. ^ "Commencement Address at American University, June 10, 1963". John F. Kennedy Presidential Library and Museum. June 10, 1963. Retrieved March 12, 2018. ^ Isikoff, Michael (January 11, 1987). "AMERICAN U. DONATION STIRS DEBATE". Washington Post. Retrieved March 12, 2018. ^ Kinzie, Susan; Strauss, Valerie (September 27, 2005). "AU Faculty Members Vote No Confidence in Ladner". Washington Post. Retrieved March 12, 2018. ^ Janofsky, Michael (October 25, 2005). "President of American University Agrees to Resign". The New York Times. Retrieved March 12, 2018. ^ American University (2007). "President-Elect Cornelius M. Kerwin biography". Retrieved July 20, 2007. ^ Business, American University Kogod School of. "American University Kogod School of Business to Offer Accelerated One-year Online MBA Program". www.prnewswire.com. Retrieved June 21, 2018. ^ "Online MBA - Earn your MBA from Anywhere". Retrieved June 21, 2018. ^ Reed, Tina (March 28, 2016). "American University President Neil Kerwin to step down". Washington Business Journal. Retrieved March 28, 2016. ^ "Former HHS Secretary Burwell Is American University's Next President". American University. January 26, 2017. ^ Larimer, Sarah (June 22, 2018). "This cat has made its college decision. It picked American University". The Washington Post. ^ University, American (June 22, 2018). "Wonk Cat, one of our campus cats, makes a debut in the @washingtonpost". @americanu. Retrieved April 1, 2019. ^ "School's First Black Student President was the Target of a Racist Attack. Now she's Suing Over the 'Troll Storm' That Followed". Fox 40. CNN. May 5, 2018. Retrieved May 17, 2018. ^ "American University". Washington Post. October 17, 2008. Retrieved December 22, 2008. ^ "About the School of International Service". American University. Retrieved January 25, 2016. ^ Ober, Lauren (January 14, 2013). "AU Names Cassell Hall". American University Washington DC. Retrieved March 13, 2013. ^ "Cassell Hall". American University. ^ "Why Did American University's Law School Plunge in the Rankings?". Washingtoncitypaper.com. Retrieved October 18, 2017. ^ "Mckinley Renovation update". American University. Retrieved April 7, 2015. ^ "Tenley Campus, Building Opportunity" (PDF). American University. Retrieved August 21, 2016. ^ "East Campus Overview". American University. Retrieved April 7, 2015. ^ "Hall of Science". American University. Retrieved April 1, 2019. ^ a b "U.S. News Best Colleges: American University". U.S. News & World Report. ^ a b c "Common Data Set 2015-2016" (PDF). American University. ^ "American University". usnews.com. U.S. News & World Report L.P. Retrieved April 11, 2019. ^ "AU Students Named Most Politically Active". Princeton Review. Archived from the original on February 15, 2015. Retrieved October 4, 2008. ^ "20 LEAST AFFORDABLE COLLEGES". The Daily Beast. October 16, 2013. Retrieved October 23, 2013. ^ a b c d AU Presidential Search Description, inactive pdf at american.edu/presidential_search. Retrieved April 2, 2007. ^ ""Foreign Policy survey ranks SIS master's program in top-10"". Archived from the original on January 10, 2009. Retrieved April 3, 2007. CS1 maint: BOT: original-url status unknown (link). American Weekly. March 8, 2007. Retrieved April 2, 2007. ^ "U.S. News & World Report Best Public Affairs Graduate Schools". U.S. News & World Report. Archived from the original on March 3, 2016. Retrieved March 6, 2016. ^ "2017 Spotlight Challenge". AACSB. Archived from the original on June 17, 2017. Retrieved July 5, 2017. ^ American University (September 24, 2018). "President Sylvia Burwell Announces Sine Institute of Policy and Politics on Morning Joe". Retrieved April 6, 2019 – via YouTube. ^ american.edu Archived May 15, 2006, at the Wayback Machine Retrieved June 15, 2011. ^ "Fall 2018 North American College Model UN Rankings and Recognition". bestdelegate.com. Best Delegate. Retrieved March 6, 2019. ^ "Student Media". American University. Retrieved October 6, 2011. ^ Hecht, Yehoshua; Hecht, Esti. "About Us". ChabadAU.org. Retrieved February 15, 2018. ^ "About Us". AU.Hillel.org. Retrieved February 15, 2018. ^ "FSL Chapter Conduct Status.xlsx". Google Docs. Retrieved February 15, 2018. ^ "Fraternity and Sorority Life - Fall 2017". Google Docs. Retrieved February 15, 2018. ^ "Environmental Issues Project Team". American University. Archived from the original on June 23, 2009. Retrieved June 8, 2009. ^ "Profile: American University's EcoSense". DC Youth Environmental Alliance. Archived from the original on April 14, 2009. Retrieved June 8, 2009. ^ "News Release: American University Environmental Science Department Finds Cafeteria Waste Reduction in Trayless Study". American University Department of Environmental Science. Retrieved June 8, 2009. ^ American University – Green Report Card 2009. Greenreportcard.org (June 30, 2007). Retrieved on 2011-11-22. In 2011, American University's School of International Service building received the Leadership in Energy and Environmental Design (LEED) Gold certification for its 70,000 square foot building that is renowned for sustainable design and "cradle-to-cradle" philosophy. ^ American University | Scorecard | Institutions | AASHE STARS. Stars.aashe.org (January 31, 2011). Retrieved on 2011-11-22. ^ Andrews, Avital. "America's Greenest Colleges: The Top 10". Sierra Club. Retrieved April 7, 2015. ^ Sine, Jeffrey A. (November 21, 2014). "Fall 2014 Board of Trustees Meeting -- Sustainability & Fossil Free Discussion and Decision" (Press release). American University. Retrieved March 12, 2018. ^ Alexander, Kelly (March 28, 2016). "American University Achieves Energy Milestone: Solar Energy Now Comprises Half of AU's Power". American University. Retrieved March 12, 2018. ^ "Carbon Neutrality is Now Reality at American University" (Press release). American University. Retrieved April 25, 2018 – via PR Newswire. ^ "Patriot League". patriotleague.org. Retrieved July 28, 2016. ^ "American University Television". auatv.com. American University Television. Retrieved August 5, 2014. ^ "AU Student Media". Austudentmedia.org. Retrieved October 18, 2017. ^ "ATV". Auatv.com. Retrieved October 18, 2017. ^ "ATV News". auatv.com. Retrieved February 15, 2018. ^ "ATV Special". auatv.com. Retrieved October 18, 2017. ^ "ATV Shortz". auatv.com. Retrieved October 18, 2017. ^ "ATV Rapid Fire". auatv.com. Retrieved October 18, 2017. ^ "ATV American Dream". auatv.com. Retrieved October 18, 2017. ^ "Meet Jason Gaines". American University. April 3, 2012. Retrieved October 7, 2013. ^ "ATV SportsZone". auatv.com. Retrieved October 18, 2017. ^ "ATV Superheroes Registered". auatv.com. Retrieved October 18, 2017. ^ "ATV in the TAV". auatv.com. Retrieved October 18, 2017. ^ "Tech tAUk Reloaded". Tech tAUk Reloaded. Retrieved October 18, 2017. ^ "American University School of Communication". American University. Retrieved March 18, 2018. ^ "Michael D. Cohen". Phillips Nizer LLP. Archived from the original on August 19, 2007. Retrieved April 22, 2018. ^ "Did You Know?". American University. August 27, 2012. Wikimedia Commons has media related to American University, Washington.